According to SMB email management company Intermedia, some 190,000 iPhones and iPads were activated on its network in the first ten months of 2013, grossly outpacing No. 2 Samsung's 29,000 activations. 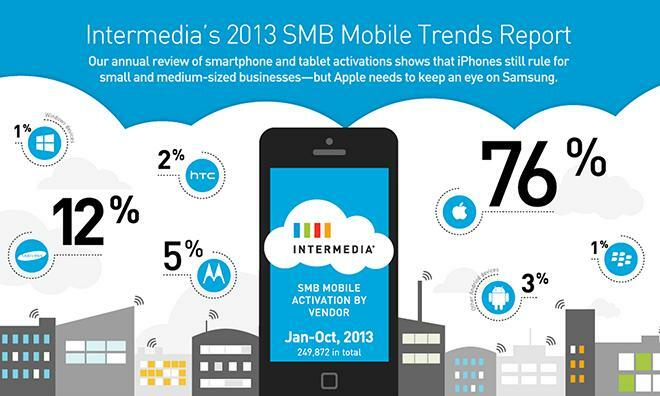 In its annual "2013 Small + Medium Business Mobile Trends Report," hosted Microsoft Exchange provider Intermedia said Apple devices helped push SMBs further toward mobile with 190,000 device activations from January to October, a number representing 76 percent of total activations seen by the firm. Intermedia claims to be the world's largest third-party provider of hosted Exchange, delivering integrated email, calendars, contacts and other business tools to nearly 700,000 business users. Findings were gathered anonymously from the company's ActiveSync activation program. While Apple accounted for a huge portion of activations over the first ten months of the year, Samsung also grew with 29,000 device adds. Coming in third was Motorola with over 13,800 activations over the same period. Microsoft's Windows-powered smartphones and tablets saw activation increase of 93 percent, though their baseline marketshare was quite small. Other interesting takeaways from the study include SMB's predilection for the iPhone 5s over the cheaper 5c. Since launching in October, the iPhone 5s rang up 6,906 activations, compared to the 1,521 for the 5c. Further, the iPhone 5, 4S and 4 all saw more activations than the newer low-cost model. The firm postulates the lackluster iPhone 5c performance may be attributed to businesses being more motivated to buy a device based on functionality than by price. Finally, the overall SMB mobile market is still expanding, with the total aggregate of device activations increasing from 88,680 in 2011, to 217,050 in 2012. Up to October, total activations for the 2013 calendar year stood at 249,872 devices.